Dubai has awarded a 700 MW Solar CSP Contract For Mammoth Mohammed Bin Rashid Al Maktoum Solar Park. The entire solar park is planned to produce 1 GW in 2020 and 5 GW in 2030. The tower will have a height of 260 meters. Gemasolar is a concentrated solar power plant with a molten salt heat storage system. Gemasolar is the first commercial solar plant with central tower receiver and molten salt heat storage technology. It consists of a 30.5 hectares (75 acres) solar heliostat aperture area with a power island and 2,650 heliostats, each with a 120 square metres (1,300 sq ft) aperture area and distributed in concentric rings around the 140 metres (460 ft) high tower receiver. The total land use of the Heliostats is 195 hectares (480 acres). One mirror is enough to power 10 households. 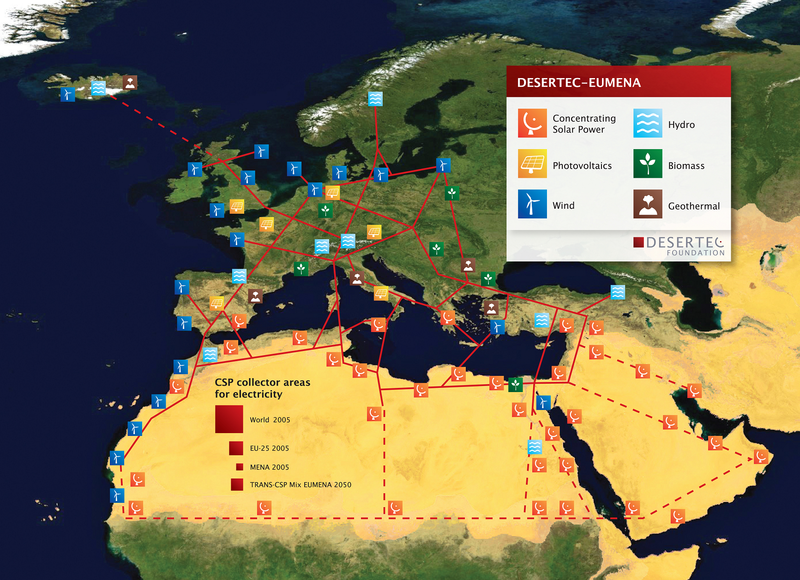 Desertec was the grandiose plan dating from 2009 to build large scale CSP plants in the Sahara, to provide Europe and the Maghreb with solar energy. Now several partners within the project are withdrawing, like HSH Nordbank, Bilfinger and E.ON. This could be the beginning of the end of the project. The remaining 35 international companies cannot agree upon how to continue the cooperation. Editor: thank God! The last thing you want to invest your money in is a large scale solar project in the middle of the coming Caliphate. In the coming few years the price of solar panels could further decrease dramatically to as low as $160,- for a 400 Watt panel. This will bring solar energy within reach of nearly everybody. European governments should pass the message to its populations that individual households will have a responsibility to take care of at least a share of its energy needs by generating it itself. Within a time span of merely ten years most households owned a personal computer with internet connection. A similar development should happen with solar energy. 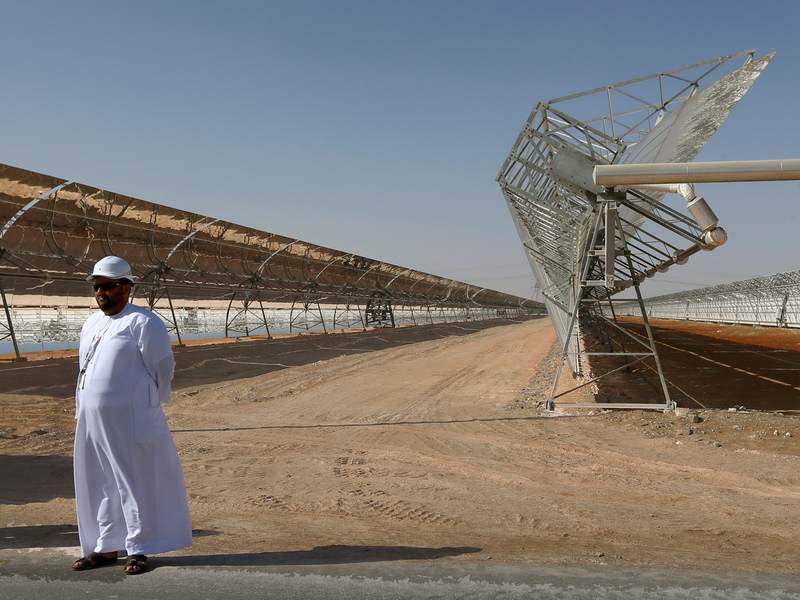 100 MW, $750 million, 768 adjustable parabolic “trough mirrors”, located about 75 miles southwest of Abu Dhabi, will result in 7% renewable energy for this desert nation. Abengoa’s 280 MW Solana CSP Plant, located about 70 miles southwest of Phoenix, Arizona, nears completion. Uses molten salt solar for thermal storage capacity (6 hours). Site will consist of 32,000 parabolic trough solar collectors. After completion 85 permanent jobs will carry on maintenance. 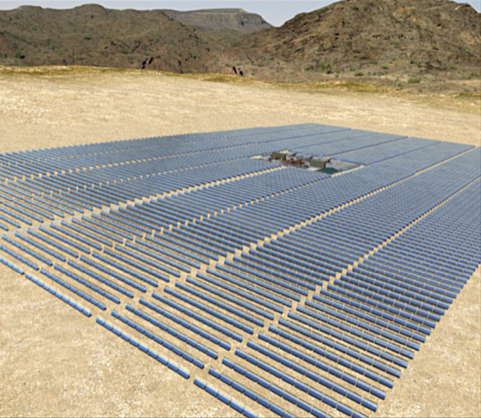 The Solana project will produce clean electricity for 70,000 homes.